The Scottish Republican Socialist Clubs were formed in May 1973. The Clubs were formed by the republican element of the John MacLean Society, who felt that the British left members were cherry picking John MacLean’s work from an “inter”nationalist point of view. Or more correctly, from an outright Unionist position. Looking ahead to a post-independence Scotland we realised that the demand for a Scottish Socialist Republic was almost bound to take some form given the nature and history of the Scottish electorate. However to have formed a specific party on that base, as had been attempted before, would have been to pre-empt the situation and become bogged down in the sectarianism of contemporary international left divisions between followers of Trotsky, Stalin, Mao etc. The Clubs sought not to be too specific in their definition of socialism and to concentrate on the specific arguments of John MacLean and James Connolly. Not that we considered the other arguments to be irrelevant or unimportant, but that we found good socialists from all these denominations becoming entrenched in dogma and forgetting their huge areas of agreement. In our case, we felt that there was a strong need to bridge a gap in order to provide the spadework proving that socialism and nationalism of anti-imperialism need not be two different ideals but one and the same. The two objects are certainly not contradictory, and are only made to appear that way by the Great British Nationalist propaganda of our imperialist masters and their dupes of left and right. So the Clubs were formed as a cross-party organisation with a common unshakable and identifiable goal: Scottish Republican Socialism in the long term and support for Scottish Independence in the short term. We were centred in Glasgow but also active in Aberdeen, Dundee, Edinburgh with other smaller local communs. The cross party concept worked with the SNP, but not Labour and the Unionist left, apart from odd individuals. The IMG would be our only breakthrough. Some of us, including the late David Leadbetter and the late John Carlyle, came from the International Marxist Group (IMG). I first initiated MacLean’s Republicanism in their journal, the Red Mole, taken from an old Marxist quote, “We recognize our old friend, our old mole, who knows so well how to work underground, suddenly to appear: the revolution." The decision to support a Scottish Workers Republic was taken at the next IMG Conference. Tariq Ali needed no convincing, nor did Bob Purdie, their leading Scots theorist. Bob is now with SNP and mellowed slightly on the Marxist front. He told me recently I was far too radical for him. We still remain friends and comrades even though we have hardly met over the years. The IMG ran their regular meetings like University tutorials, where members took it in turns to produce and read a paper on a selected topic for general discussion. If nothing else, I owe them for a thorough grounding on Marxist politics and education. In 1974 some more IMG members came across to join the SRSC, including; Charlie Gordon (now a Labour MSP), Jim McKechnie (now a Labour Cooncillor and Labour Committee on Ireland frontist), Matt Montgomery, now in Glasgow Trades Council and the mysterious Norman Easton. Others have various careers in the “Labour Movement”, including full time Union positions, which is akin to winning the pools in financial terms. My wife still chides me for not taking the Queen’s shilling, like the rest of my former “revolutionary” comrades. Almost immediately they wanted us to form a Scottish Workers Republican Party. Not for the last time I did not think we were not ready, or had enough support to go down that road. I went along with it, against my better judgement. At the inaugural Ard Fheis that year, held in Stirling University, the IMG entrists held the platform and condemned militarism within the ranks. We were so shocked that we all walked out and left them with the Party they did not want. It lasted about three months and then folded. According to Henry Drucker’s book ‘Breakaway: The Scottish Labour Party’ the “Socialists expelled the Tartans”. At no point did Drucker interview or contact any of us before publishing this untruth. His book more or less admits they were entrists who went on to enter and destroy the Scottish Labour Party, formed by Jim Sillars and co. Drucker was an American, of suspicious background, who went on to be a chief fund raiser for Blair’s New Labour Party. Many figures in the Labour Party attended CIA courses in the US, including Lord Robertson of NATO; a former SNP member and anti-nuclear campaigner, Jim Murphy, Lord Mandelson, etc, etc. etc. Easton then produced his own magazine, Crann Tara, then Scottish Worker. During this period there were a wave of strikes in Scotland against Labour’s Pay Freeze, leading to Labour sending Troops IN to Glasgow to drive Bin Lorries, Fire Engines and Ambulances to scab on the strikers. The Royal Highland Fusiliers were based in the HLI TA Centre in Maryhill, where many of their trucks were sabotaged. Some joined the Republican Clubs and when they went back to the north of Ireland wanted to hand their rifles in to the IRA. Sinn Fein advised them to buy themselves out and support their own Republican Movement in Scotland. Alastair Smith, who left the RHF, and Janet Carpenter of the Clubs and formerly of the Workers Party of Scotland, turned Queen’s evidence against them in the Trial of the Army of the Provisional Government (APG) claiming they met them in an attempt to form an umbrella organisation. Smith and Carpenter tried to form their own Scottish Republican Movement, before hurriedly moving to England. 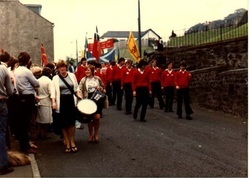 The third breakaway came in 1979 when some Club members decided to form the Scottish Republican Socialist Leagues while some of the leading Club members were remanded in prison awaiting trial. The Clubs ran a loose structure, whereas the Leagues wanted a tighter, centralised, almost party like structure. I wasn’t opposed to it in principle. I just did not think we were ready. In 1980/1 it was decided to close the Clubs in favour of a Scottish Republican Socialist Party. Again, I was personally opposed, but went along with it because after the League split experience I did not want to go through that again. There just wasn’t a grassroots groundswell for that. It was hard enough pushing Republicanism in Scotland as a concept through a cross party organisation. We practically had to invent Republican Socialism to take up the broken links of past history. In addition we attended the Ard Fheis meetings and events of all the Irish groups in Ireland and let them know we were attending all. All understood and treated us well often better than their support groups in Scotland who were commonly infiltrated by the Brit left and prey to British divide and rule tactics. The IRSP was formed a year after the Clubs by those wanting something between SF and the Workers Party. We were very close to them. However Ruairi Ó Brádaigh perhaps understood Scotland and the need for Celtic unity best. He resigned as President of SF and formed Republican Sinn Fein. The 32's have also taken an interest in Scottish republicanism. Perhaps surprisingly the ‘Stickies’ in Scotland had the best political understanding of all the Irish groups. The SRSP itself would affiliate to the Scottish Socialist Party in 1998. When we later pulled out of the SSP we had to go back not to the SRSP, but to the broad cross-party, looser structure of the Clubs - now the Scottish Republican Socialist Movement. Who knows what the future will hold? We can but try to push forward. Club can take whatever form the persons setting up same wish it to take. In any situation where political agitation is not possible, then the club can centre itself round Scottish History, Folk Music, etc. Where politics are possible, then the avowed aim is to create a forum for Nationalists and Socialists to come together for discussion and debate on an Independent Socialist Republic. Any number of clubs can exist in any one town or area without a clash of interest. They merely name the branch by the popular name of the district or after a Scottish hero, to avoid confusion. The slogan for each club branch must always be 'For a Scottish Republic'. Where one club wishes to start a national campaign round a particular issue, then that club shall canvas all other clubs and set a date for a meeting and the level of commitment of each club will be left to each club. No national structure exists, but once a year a Convention will be held. Any member wishing to stand for elections is urged to stand as an 'Independent Scottish Republican' rather than as a club candidate. No restriction is therefore put on any club as to the methods they wish to bring about independence. 2 - To promote a specific interest in Scottish working class affairs at all levels i.e. cultural, political, socio-economic and historical. 3 - To encourage discussions with all left wing groups, especially those with an interest in Scottish affairs. 4 - To encourage a discussion with the left wing of the Scottish independence movement and similar progressive forces. 5 - To look at the position of women in Scottish cultural terms and encourage action in the fight for independence and equality of women. 6 - To support the right of the working class everywhere to gain control of the production and distribution of the Earth's resources, to be enjoyed by all mankind in a Socialist Intl. 7 - Membership is open to individuals of all political parties who cannot express their socialism in Westminster orientated groups. The club is a forum for dialectical debate on the socialist and Scottish question and a venue for joint activity on agreed matters.